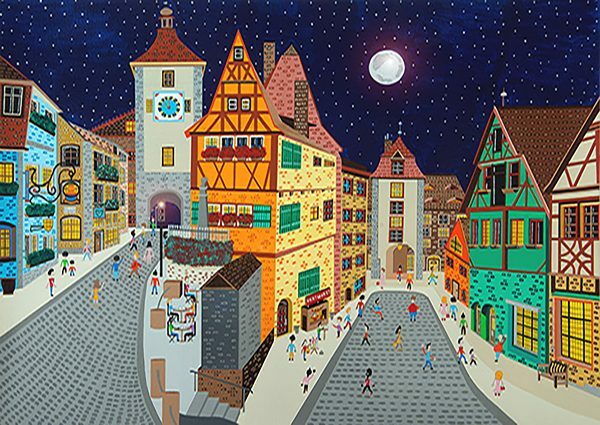 I have finally completed my first city scene painting of the year, which is of Rothenburg, Germany. I started this all the way back in January, but with commissions coming inbetween, this has been a long time in creation. I’m really pleased with how it has come out, in fact it’s one of my favourite city scenes. It is also the first “night time” scene I’ve done in a while. There are lots of people milling around doing the tourist thing, even buying some Bratwurst! If you haven’t already, I encourage you all to Google “Rothenburg” as well, as it’s one of the most stunning little towns I’ve seen. I’ve thoroughly enjoyed painting this, so I really hope you all like it! The painting will be available from DegreeArt.com, along with a series of limited edition prints.